I'm sad to say I've discovered the real joys of indie Highland Park waaaaaaaaay too late. Independent HP releases are getting fewer and fewer each year, and the double-digit aged ones are getting exorbitant price tags. So I'm going to just keep raiding my sample stash for fabulous items like this. It has a straw color, which is great to see in a 24yo. The nose is of fields and farms. Hay, heather, lavender flowers, clay and barley. Chiles, ripe pears and mint candy. It shifts gears with time in the glass, releasing notes of lime juice, toffee pudding and apricot jam. The palate is intensely earthy and herbal. An organic mossy note, tar, rocks, salt water and mineral water. Coal smoke and a hint of weed. With time, a gorgeous bitterness emerges alongside a mild brown sugar note. The beachy, salty finish also has hints of lemons and brown sugar. Mint leaves and dried herbs. That herbal bitter note rumbles right on through. Fan-fuggin-tastic. I didn't dare add water to this HP because it hit all the happy spots as is. 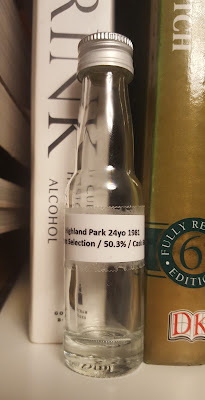 A bit more rugged than the average well-aged HP, this whisky is A-OK if the field, farm, mineral and beach notes thrill your nervous system as they do mine. The more whisky I taste, the further I drift from the most famous Malt Maniac's notes and ratings. So I was surprised to see that my review nearly mirrors Serge's. 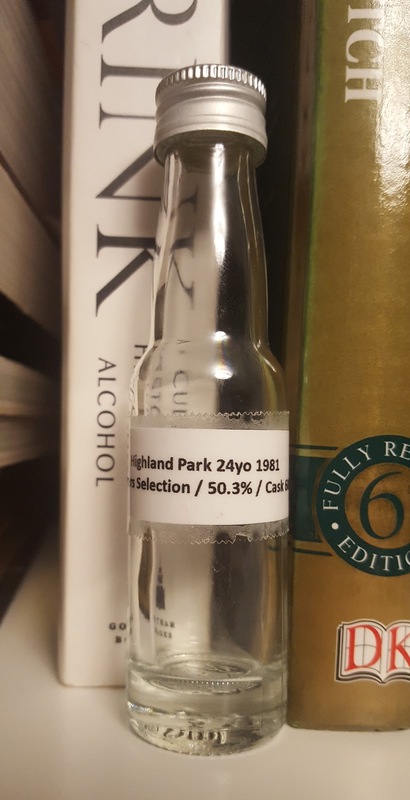 Back when he reviewed it in 2012, the whisky was long sold out. Now that 2017 is in its second half, my review is even less applicable to our lives. Glad I could be of service!